SUCH A DEAL ! WHO ELSE DOES THAT?. After listening to the recording, they decided that it was their best live performance ever and wanted to share it with fans worldwide. Issued in 2001,Alive 1997 is comprised of 45 minutes of non-stop live mixing that showcases the duo's unique and influential DJ style. Silver 180g vinyl - Slip mat with Daft Punk logo (black with. Robot Rock/Oh Yeah Alive 2007 Album 2. Touch It/Technologic Alive 2007 Album 3. Too Long/Steam Machine Alive 2007 Album 5. Around The World/Harder Better Faster Stronger Alive 2007 Album 6. ). Silver 180g vinyl - Slip mat with Daft Punk logo (black with phosphorescent ink). - Alive 2007 double LP in a triple gatefold (clear cyan vinyl 180g). This Limited Edition DELUXE Box will contain Alive 1997 (1LP) Alive 2007 (Double LP) lots of great bonus content, more details below. Aerodynamic Beats - Gabrielle, Forget About The World. Face To Face - Short Circuit. Burnin - Too Long. Hier folgende 4 Vinyl LP / Here following 4 Vinyl LP Pop englischsprachig. Pop international. noch nicht verfügbar. Rock'n Roll. Hier folgende 2 CD / Here following 2 CD Indo Silver Club. Pop international. Around The World. Face To Face. Short Circuit. Veridis Quo. DAFT PUNK "ALIVE 2007" CD NEW! ALIVE 2007. Hier folgende CD Superheroes / Human After All / Rock'n Roll. Da Funk / Dadftendirekt. Aerodynamic Beats/Gabrielle,Forget About The World. Face To Face / Short Circuit. Burnin' / Too Long. ARTIST: daft punk. TITLE:Alive 1997/2007. RECORD CONITION: mint new. COVER: VG . DAFT PUNK - HOMEWORK & DISCOVERY 2 CD 30 TRACKS INTERNATIONAL POP NEW! ALIVE 2007. Hier folgende CD Superheroes / Human After All / Rock'n Roll. Da Funk / Dadftendirekt. Aerodynamic Beats/Gabrielle,Forget About The World. Face To Face / Short Circuit. Disc(s) are professionally cleaned and may contain only light scratches that do not effect functionality. Includes disc(s), case, and artwork. May be missing booklet. Case may not be an original jewel case. Artist: Daft Punk. Title: Alive 2007. Format: CD. Studio: Virgin Records. Condition: New. Genre: Dance. Release Date: 2008-02-25. Artist: DAFT PUNK. Format: CD. Condition: New. 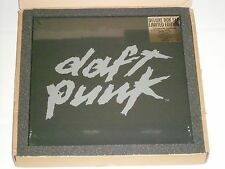 DAFT PUNK - BOX ALIVE 2007/ALIVE 1997 4 VINYL LP NEW! Hier folgende 4 Vinyl LP / Here following 4 Vinyl LP Pop englischsprachig. Pop international. Label: Parlophone Label Group (PLG). "Indo Silver Club". "Short Circuit". Format: CD. "Around The World". Condition: new. We will dispatch the product after receiving the money. We will do so too. Label: PLG Int. Format: Vinyl LP. Extra-Infos: Book, Vinyl, Slipmat, Vip Pass Download Card. We will dispatch the product after receiving the money. We will do so too. We'll strive to resolve your problem. 21 ROLLIN´ AND SCRATCHIN´/ALIVE. This CD is new, factory sealed, unplayed, original. All other countries 3-4 weeks. Official release, WEA - 5098422. 12 TOO LONG. 26 ROCK´N ROLLÂ. 25 HUMAN AFTER ALL. Label: Parlophone Label Group (PLG). "Face To Face / Short Circuit". Format: CD. We will dispatch the product after receiving the money. "Around The World / Harder Better Faster Stronger". "Aerodynamic Beats / Forget About The World (Gabrielle)". Includes disc(s), case, booklet, and back artwork. May show slight wear. Disc(s) are professionally cleaned and may contain only light scratches that do not effect functionality. Daft Punk ‎–. EMI ‎– 5099950168729. CD, Album, Reissue. Other (Discovery catalog#): 724354278228. Mould SID Code (Discovery): IFPI 2552. Vocals –Romanthony 10:00. 2-14 Too Long. Vocals –Todd Edwards 4:00. Around the World/Harder Better Faster Stronger. Too Long/Steam Machine. Aerodynamic Beats/Forget About the World. Face to Face/Short Circuit. Artist: Daft Punk. Title: Alive 2007. Format: CD. Studio: Virgin Records. Condition: New. Missing Information?. Artist: DAFT PUNK. Format: CD. Missing Information?. Artist: Daft Punk. Title: Alive 2007. Release Date: 2007. Format: CD. Item Condition: New and unplayed. Burnin'/Too Long. Around the World/Harder Better Faster Stronger. Too Long/Steam Machine. Vinyl - Pre Loved. Vinyl - New. Sheet Music / TAB Music. Music Calendars. DVD - Music. DVD - Movie. Alive 1997 (Part 1). Alive 1997 (Part 2). Format: VINYL LP SET. Catalogue Number: 0825646225354. Superheroes/Human After All/Rock'n Roll. Touch It/Technologic. Release Date: 22/12/2014. Around the World/Harder, Better, Faster, Stronger. Alive 2007. Toshiba EMI. Harder Better Faster Stronger. CATALOGUE No RECORD LABEL Rockn Roll. Human After All. Rollin And Scratchin. Artist: Daft Punk. Daft Punk - Robot Rock. Daft Punk - Oh Yeah. Daft Punk - Technologic. Daft Punk - Crescendolls. Daft Punk - Too Long. Daft Punk - Steam Machine. Daft Punk - Around The World. Alive 1997 & Alive 2007 - Punk Daft LP Free Shipping! Artist Punk Daft. Alive 1997 & Alive 2007. Alive 1997 (Part 1) - Alive 1997 Album. Alive 1997 (Part 2) - Alive 1997 Album. Robot Rock/Oh Yeah ï¿½ Alive 2007 Album. Touch It/Technologic ï¿½ Alive 2007 Album. Daft Punk - Alive 2007. Format: CD, Album, Mixed. Records advertised as Sealed or Unplayed should be Mint. The cover and contents suffer from folding, scuffing of edges, spine splits, discoloration, etc. Interpret Daft Punk. Label Virgin EMI. Format Album. Alive 2007 - Punk Daft Compact Disc Free Shipping! Artist Punk Daft. Alive 2007. Compact Disc. Format Compact Disc. Superheroes/Human After All/Rock'n Roll. Aerodynamic Beats/Forget About the World. Too Long/Steam Machine. EAN 0603497913695. Daft Punk : Alive 2007 CD (2008) NEW Title: Alive 2007 Artist: Daft Punk Genre: Dance|Leftfield Duration: 73.50 mins Format: CD / Album Type: CD No. of Discs: 1 disc(s) Studio / Label: Virgin Records UK Release Date: 25 Feb 2008.